Aurora Borealis Lodge has been sharing our Alaskan Accommodations and Aurora Viewing Tours with guests since 2003. 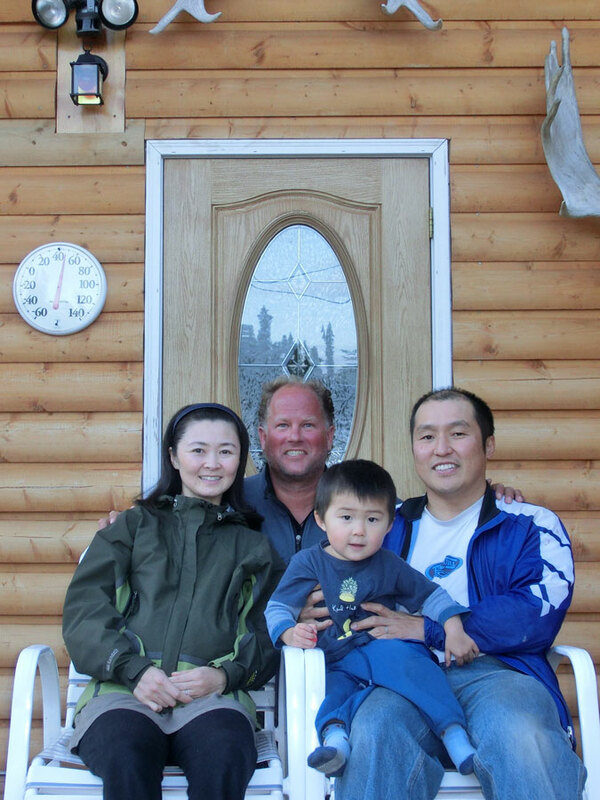 The Lodge is family owned and operated by Mok & Akiko Kumagai. We are located high in the hills north of Fairbanks near Cleary Summit. Our location offers world class opportunities to view the Northern Lights. We hope that we can continue to share the joys of experiencing the fantastic aurora borealis and the surrounding Alaskan nature with you. Logan Ricketts and I (Mok Kumagai) first met in January 1996. I was a tour guide bringing aurora viewers to Skiland, one of Fairbanks’ local alpine ski areas which doubled as an excellent aurora viewing locale. At the time, Logan was the owner/operator of Interior AK Adventures, a Fairbanks-based fishing and raft guiding company. An avid skier/racer/coach, he spent the winters working at Skiland, and thus that’s where we met and quickly became good friends. As aurora viewing tourism slowly grew, so did the need for more viewing locales. One day, Logan said, “Hey, my folks have this great piece of property up on Cleary Summit, next to the old ski hill. We should build a viewing lodge. And if anything, we’ll have a cool house to live in.” Plans literally were sketched onto bar napkins (the now-defunct Backdoor Lounge being our bar of choice…mostly for the $1 beer!) and in August of 1998, we started to chain-saw some trees down on the Cleary Summit lot. Juggling other jobs and cold dark winters, we, with lots of help from family & friends, finally finished the Main Lodge and opened for business in February 2003. In the summer of 2006 we started building the accommodations lodge. Two key points were noted for this second construction: 1). Let’s not do log. It takes too long, and they’re heavy, and 2). Let’s get nail guns. Thanks to this, construction went a little faster. In December 2008, our first guests stayed in the new overnight units. During this second phase of construction, Logan noticed that he was having trouble holding on to screws with his left hand. But he kept plugging along, not thinking much about the “minor” inconvenience. In the spring of 2007, his doctor told him to go down to Seattle to get a specialist to check it out. When he came back, he broke the terrible news: he had ALS. Skiing, fishing, and building were Logan’s passion, in that order. So ALS didn’t stop Logan from building, thus the December 2008 completion. And although he stopped fishing professionally, he kept fishing personally as long as he could. And he kept skiing, and downhill ski race coaching as long as he could. In fact, he wanted to build more, so he started to build another log (again!) house in the summer of 2010. And in December 2012, Logan’s Chalet welcomed its first guests. Since we started business in 2003, we have had the pleasure of hosting thousands of guests from around the world. We hope that we can continue to share the joys of experiencing the fantastic aurora borealis and the surrounding Alaskan nature with you.